POB merchant processing services run on PCI Compliant pos terminals, and running Point of Banking processing is in high demand with merchants who are seeking ways to keep their cost of doing business as low as possible. There are two ways to setup a pob terminal in your retail business. The terminal can either be customer activated where you allow your customers to run their own transactions... or, you can order an external pad pad to go with your terminal and get setup so your cashier runs the transaction for your customer. Either way, you won't be paying expensive processing fees! 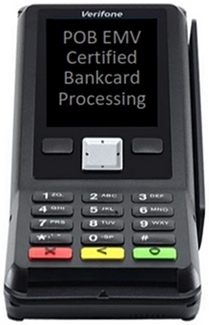 When allowing customers the opportunity to run their own transactions on your pob card service terminal, once they complete their transaction and hand you the receipt, you are simply accepting the amount on the approved receipt in exchange for good and services, and/or cash back to the customer. This is the most simple option for some merchants. on is an amount that is slightly larger than the average sale at the register. Depending on the type of retail business, some merchants like their cashier to run transactions for the customer. With this method, the customer always hands their card to the cashier who decides what dollar amount is being run on the terminal that is a whole dollar amount that is an increment of either 5 or 10. Exact dollar amounts cannot be run under industry regulations because there is a convenience fee added to the transaction which pays for the cost of processing each transaction. The cashier can choose an amount that is just above the customer's purchase amount, and make change. This enables the merchant to give as little cash back as they want during times when there is not a lot of money in the register. Many customers like to get some cash back and view this as a convenience, but the merchant may not always have enough cash on hand or may want to make as little change as possible during purchases. When merchants have taken in a lot of cash, they can provide the convenience of giving larger amounts of cash back to their customers who would like that and in doing so the merchant is making a bank deposit which helps take care of having too much cash in the register. Point of banking processing services is a PIN based cash withdrawal where the terminal prints a two part receipt, one for the customer and one for the merchant. The merchant is accepting the dollar amount shown on each approved terminal receipt as though it were cash being used by the customer to make purchases. If a customer runs a transaction for $50 and is making a purchase in the amount of 36.89, the merchant accepts the $50 transaction receipt as though it were a $50 bill and gives the customer $13.11 in change. Funds are sent back to the merchant's bank account in about 3 business days. By choosing to get an external pin pad with their pob terminal, the merchant can have their cashier run transactions for the customer and use the 'other' button to choose the 5 dollar amount just above the amount the customer's purchase is for to give as little cash back as possible. When doing this, merchants are only making change for a $5 bill at any given time, therefore the merchant is not handing out very much cash. Using the program this way is basically the same as accepting cash from customers which retail merchants are doing anyway. (Please request the other button when placing your order). The best part of our program that you won't find anywhere else is we keep pricing low for the equipment and for the cost of the pob processing service. We do this thru volume selling that enables pricing to be kept reasonable and not inflated like other service providers. There are no hidden fees, or early cancellation fees should you decide to quit the program. Equipment is never locked, so it can be used for other purposes. When dealing with business owners who are working hard to make a living for themselves and their families, we keep things simple and upfront so merchants know exactly what all the costs and benfits are before signing up to accept bankcards at no cost to their business. In today's world, it may seem odd that a business would treat others honestly and fair... but it's the only way to do business! Click Here if you would like complete details sent to you by email.